Do you struggle to pray consistently, feel like you don’t have time to commit to daily prayer time, or aren’t sure how to get started? Consistent prayer is important to deepen our faith, develop our relationship with God, and keep our lives on the path to follow Jesus. Keep reading for four keys to help you begin to build a more consistent, vibrant prayer life and open that crucial conversation with God. When do you check in with God each day? I loved rocking my son to sleep when he was a baby. Not only did it signal the end of a long day after working full-time and caring for two little ones, it was also my bit of quiet time in the day. Sitting in the dark silence of his room, rocking him to sleep, I could finally still my body and mind. Most nights I was too tired to read and the light of my phone was too bright to settle him to sleep. Instead, I used this time as my daily appointment with God for prayer. When my son outgrew being rocked to sleep, I was most sad about losing this special time with God. I wondered where I’d find the time and space to connect with Him in this way. Quiet time is a precious commodity in our house and I struggled to carve out a new time and space for prayer. I’ve found different solutions in different seasons. Now I’ll get up a bit early to spend some time with God in the morning hours before anyone else is up. Other times, I’ll grab some quiet time after the kids get to sleep (if I’m not too exhausted myself). I’ll also engage in God a conversation as I’m driving to work or even in the parking lot before I go into the office. How do you schedule time with God? Consistent prayer in our busy lives is difficult. Even though I study, write, and teach about prayer, I have to admit it’s hard for me too. It’s been years since my son was small enough to rock to sleep and I still miss those rocking chair conversations with God. I’ve learned, though, it’s not about where I pray, but that I do pray. It’s not about how I pray or the words I use, but that I open my heart for conversation. It’s not about when I pray or how long I pray, but that I pray daily, keeping God close to my heart and on my mind. Perhaps the hardest is that prayer also requires me to be quiet and listen so I can hear the still, small voice of God. If you want to be consistent in your prayers, you first need to get started. Don’t wait until you’re an expert at prayer or have it all figured out. Simply start with “hello”. Open the conversation and start where you are. Greet God like a friend – share what’s going on in your day, what’s weighing on your heart, your doubts and fears, and where you need his help. As you continue this conversation each day, you’ll grow more confident in your prayers. No matter where you are, just start the conversation. I can talk all day about wanting to exercise more consistently, but until I make it a priority and put it on my calendar, it’s not going to happen. So, make prayer a priority in your life. Carve out time in your schedule – write it on your calendar and set it as a priority appointment. We make time for the things we consider a priority. If you’re going to create a healthy eating habit, you’ll need more than one salad recipe, right? You need variety, a plan for eating out, strategies for managing distractions. The same is true with prayer. Praying the same prayer day after day is great, but can also lead to distraction and less engagement. So, learn some new ways to pray. Have some different methods at the ready for the days you’re more distracted, or feeling like your prayers are in a rut, or you need fresh inspiration. Changing up your prayers can be a great way to break out of a prayer rut or to reinvigorate your prayers. Keep at it! Prayer doesn’t come easy for most of us. You’ll go through seasons where your prayers are vibrant and other seasons where they’re a struggle. You’ll fall off track with your daily prayer habits and lose focus. Keep pressing forward. Pick up where you left off. Keep the conversation open with God and allow him to lead you back. Are you ready to develop a more consistent prayer life? Ready to develop a deeper relationship with God so he can work in your heart? Not sure how to find time in your busy day? 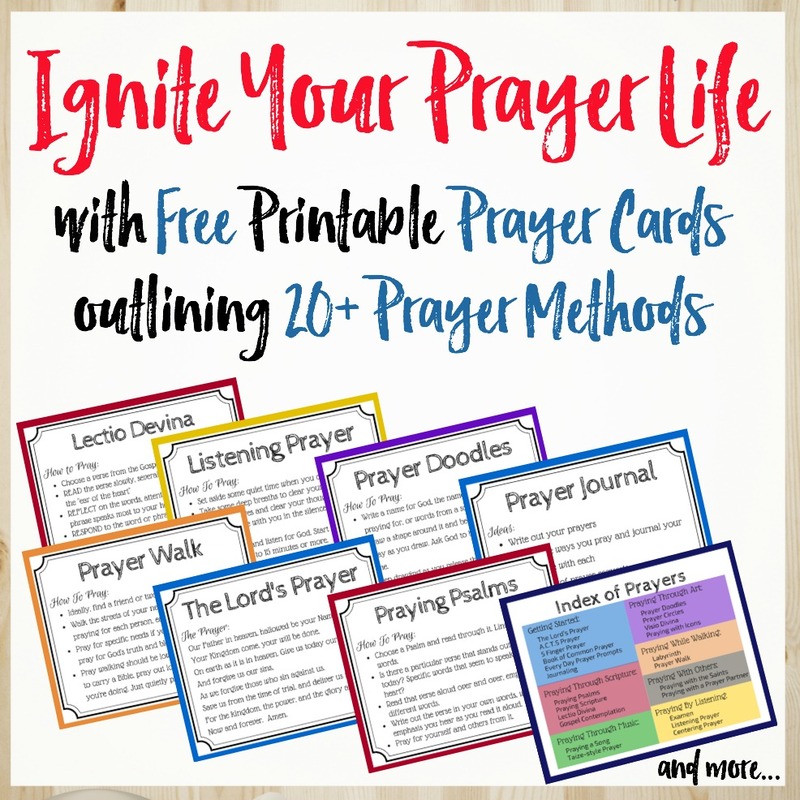 Click here for a free worksheet to help you evaluate your day and find time for prayer. Need help to design a daily prayer habit you can actually stick to? Click here to sign up for a free 5-day challenge to develop a daily prayer habit you’ll love (and keep)! Start today! Will you take a look at your schedule and carve out time this week for God? Mark it on your calendar as a priority and get started. Open the dialog and let God into your life. If you are struggling with prayer, maybe these will help: 5 questions to ask yourself when prayers seem unanswered and 5 questions to ask yourself if you’re not sure prayer matters. Don't think you have enough time to complete this study and power up your prayers? Join the FREE 5-Day 'Develop Your Prayer Habit' mini-course. Through 5 days of email-delivered lessons, you'll get clear on WHY you want to pray and design a plan of WHEN, WHERE, and HOW you'll pray. What a great read! Simple steps but perfect advise. It helped wiped away the guilt I feel when I am busy…i love the idea of seasons and mixing it up. What a beautiful portrayal of friendship that God desires from us. No strings attach..he just want us weaving our life with Him. Thanks for your honesty, wisdom and insight. Glad you liked this! I, too, can start to feel guilty when I get too busy and fall out of good prayer habits. but I don’t think God wants us to feel guilty – He’s just the perfect Father waiting for us to pick up the phone and call home. He’s eagerly waiting to resume the conversation with us, hoping this time we’ll bring him more fully into our lives. Consistency – so hard, but so necessary! Thank you for the tips today Kathryn. Love your steps sweet friend. I love rocking my grand babies and praying for them and I find myself when Colt is here in the bed between my husband and I praying that God will continue to heal him of that horrible disease. Your toolkit is awesome. I’m relaunching my blog today and I’d love to invite you to join the celebration. So glad I stopped by today from #RaRalinkup. Your space is inviting and your words are sweet. Even at 6, my son won’t let me rock him anymore… I do miss those days already. Our prayers and our relationship with God by nature (His nature) need to be grace-laden. There’s no magic formula and I don’t think He wants to be prescriptive and rigid – other than He wants to connect with us regularly. How we work that in and make it part of our daily routines will look different for each of us. Love your new site! Beautiful! You’ve covered a lot here. Will start taking out time in my “busy” schedules to have a quality chat with the Most High. Failed in 2016 though, but won’t fail this year—by His grace! Have a lovely week ahead. Thanks. Favour – I’m so glad you stumbled over here 🙂 Prayer can be difficult, but the more we invest in it and make it a priority, the more we’ll come to value the time spent. Check back here – I have some great prayer resources launching soon to help you make prayer a habit in 2017!